Netiquette. 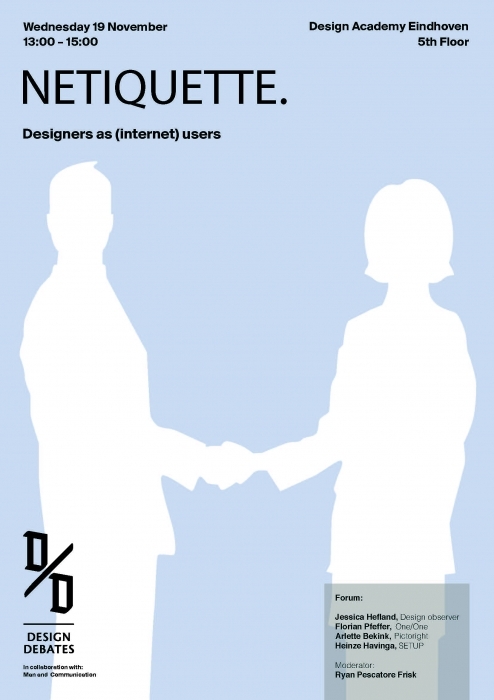 Designers as (internet) users “While etiquette is ingrained into culture, etiquette in technology is a fairly recent and challenging concept.” http://en.wikipedia.org/wiki/Etiquette_in_technology A man holding a door for a woman, someone apologizing for sneezing in public, locking a bike safely in a public bike parking and a car stopping for a light that just turned red. In ‘real’ everyday life these events seem ordinary. They happen time after time, for everyone to be seen. They seem to make sense. When trying to locate similar behavior online, a different reality appears. A lock is no longer a lock, your neighbor lives on a tropical island and a door can be anonymously slammed in your face. What is the role of design education when it comes to defining and sharing the responsibilities that we (as designers), as users of the Internet, need to take on? After their efforts to solve problems in real life, can designers contribute to a better virtual world as well? During this debate each of the members of a carefully selected panel of experts in the field/fellow netizens will briefly introduce her/his perspective on a specific form of online behavior, before being confronted with the audience and a broad range of examples that address the (lack of) conduct in online situations. From liking to sympathize, to copying to impress, “Netiquette. Designers as (internet )users” will shed fresh light on an urgent topic that deals with ‘what is’ and ‘what isn’t’ socially acceptable in online situations. Florian Pfeffer is co-founder of One/One; a studio which creates brand experiences and communication solutions across all media platforms. He is director of the :output foundation as well as the author of the book ‘To Do’ which looks at everyday life phenomenons, concrete examples, curiosities and positions from economy, the networked society, social sciences, art and (sub)cultures to investigate what we can learn for design at large. It is not only a book for designers but for everybody asking the question how we want to live - and how we can get there. Arlette Bekink is projectmanager collective rights at Pictoright. Pictoright is the author’s rights organisation for visual creators in the Netherlands: illustrators, artists, graphic designers, photographers and other professional image creators. Pictoright distributes collective royalties, manages copyrights for visual artists, provides legal assistance, offers advice and strives for a better copyright position for image creators. A few digital groups in Utrecht got together out of frustration that there was no center for digital culture in Utrecht. In 2010 we launched SETUP, originally as a temporary experiment, and now as a wonderful place where young talent and creative ideas come together to change Utrecht, and then: the world! We strive to grow a critical group of people that dares to design this brave new world, and infuse it with human values, freedoms and opportunities for creativity.